Nick's still scoping out new guitars - he mentioned checking out an Atkin guitar during the spring 2003 Eddi Reader tour on his web diary, and there's proof on the Atkin Guitars website. As HOHer Catherine Wightwick says, "In the June 2003 news, Nick is mentioned. Click on the link and there s a nice piccy [of him playing an Atkin guitar]." JM: "Yeah, Jonty (Rhodes) and a few others went to Edinburgh last week." GF: "Oh yeah. Perhaps he caught up with the festival while they were there." JM: "I think that one of the reasons they went." GF: "Oh really. A mate of mine was playing there. He won an award in fact. Nick Harper. He might even 'ave seen 'im. 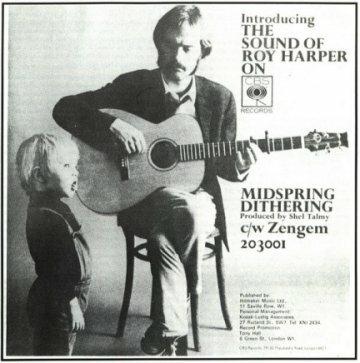 Roy Harper, his dad sang When An Old Cricketer Leaves The Crease..."
Okay, maybe we'll start watching cricket after all if the commentators have such impeccable taste! Speaking of early appearances, to complement Nick's "solo" at the 1968 Cambridge Folk Festival shown here, HOH stalwarts Dave and Sue Burnham have sent us the following 1968 CBS ad for Midspring Dithering... very impressive, most of us only had our baby pictures handed around to relatives, Nick probably got his in the NME! In addition, eagle-eyed HHOHer Catherine Wightwick is sure she spotted Nick in the video of Roy's appearance at Stonehenge 1984 - as she said, "not playing, just there". More as she rewatches the video... for documentation purposes, of course. 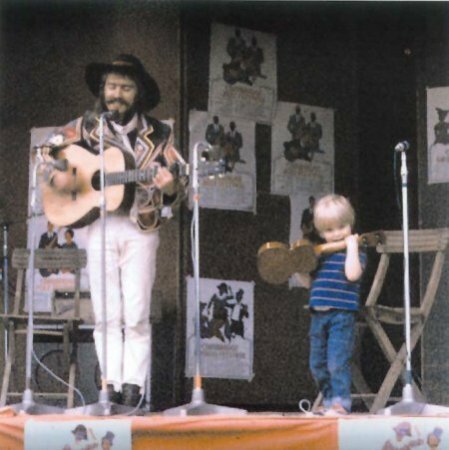 Thanks to HOH right-hand woman Philippa Lord, who pointed out that when Nick played the Stourport's Galleon Acoustic Club in 2002, an article appeared in the Kidderminster local newspaper titled Legend plays acoustic club (!). 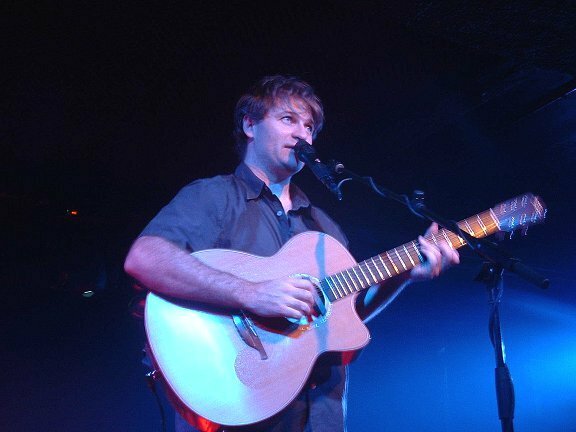 The writer Alex Day went on to call Nick "a musician at the forefront of a new generation of British acoustic performers". Now, not that the HOH doesn't actively encourage this type of behaviour, but we must say that even we were bemused by this effusive praise! We think Nick is warming up to the eventual legend status - right now, he's at "rock god" and climbing... we'll keep you posted. HOH reader Andrew "Stealth Munchkin" Hickey told us that one of his favourite gig moments ever was "...the first time I saw Roy and Nick, and Nick did the theme from Rainbow as his solo in the middle of [Roy's song] Watford Gap - it fit a *lot* better than I would have expected!" A press release for the 2002 Hull Pearson Park festival gig claimed that Nick started his solo career with a gig at the Lamp in Hull in 1994. If anyone knows if this is true - or better yet, if you were there! - please drop a line to us and give us any more info you have. If you have pictures, your name will be revered in HOH lore. Embarrassing Big Jim And The Twins reference ahoy! This appeared in Heat magazine in September 2002: "Justin Timberlake has given his most revealing interview yet to a New York radio station. [Amongst other things] he admitted calling his willy 'Big Jim and the twins'." Oh the horror! Recently, we have heard newcomers to Harperism noting some resemblance between the vocals on the latest singles by both Robbie Williams and Darius to Nick's work. Ummm, we're going to defer on this one. Though we have ourselves noted the resemblance between Nick's promo photos and *Robin* Williams... purely coincidental we're sure. HOH reader Bernie Timms sent us this story he received in a forwarded email: "A newspaper asked readers to take any word from the dictionary, alter it by adding, subtracting, or changing one letter, then supply a new definition. Some recent winners included karmageddon - 'It's like, when everybody is sending off all these really bad vibes, right? And then, like, the Earth explodes and it's like, a serious bummer.'" I'm sure Nick would agree! HOH reader (US division) Michelle J made a big noise for the Nick cause this year, albeit accidentally: "I was in the process of putting together a serious stereo. So I was in Best Buy (US electronics chain) looking for speakers. Surprisingly, I really got into testing them all out with the sales guy. He was trying to get me to buy an absolutely HUGE pair of speakers that seemed to have the same sound (but much more power) as the somewhat smaller speakers I was interested in. He was trying to convince me that the sound quality in the bigger ones was better than the smaller ones, but I just couldn't hear it. So he asked me if I had any music of my own, anything that I was more familiar with, that he could play through the gigantic speakers - thinking that I might hear the difference. I pulled out the CD that was currently in my Discman. It was Nick Harper's live CD, so he put the CD in and CRANKED that ghettoblaster - soon we had an audience, but I ignored them trying to figure out what the sales guy was trying to prove. There were about 5 people hanging around listening, and I thought nothing of it until somebody asked the sales guy not about the speakers, but where he could buy the CD! I stepped up and gave the guy the Quixotic URL. Then long after I'd made the decision to take the small speakers, I pretended to need to hear the CD at different levels. All in all, Nick got 10 minutes of pure exposure at decibels I never thought possible." Go Michelle! During a mailing list discussion of people who insist on talking during gigs, Dave Burnham (whose reviews can be read on the site) told the following funny story about his experience promoting a gig for Nick: "Seven years ago I organised a gig for Nick at the Beachcomber in Brighton. When I originally checked the venue out it had a nice stage in the corner of the room, but when we turned up it had vanished. Nick pondered this for a few moments and strolled off down the seafront. A few minutes later he whistled to attract my attention. He'd found some builders and had managed to cadge a piece of 8 x 4 feet chipboard off them, so I gave him a hand to carry it back to the Beachcomber. Nick then chatted up the bar staff and was presented with an array of beer crates which he arranged to support the chipboard... hey presto! One instant stage - what a guy! We'd also had some problems with people insisting on talking during the set and our 'Beloved Enforcer' Paul Davison told me about signs they had up around Dingwalls at the time (Please S.T.F.U. during the performance). I printed off about eight of these and stuck them to the walls and columns of the venue before the gig. Nick had clocked these earlier in the evening and when he went on, eyed them up from stage, then said, 'Hmmmm... S.T.F.U... Start Throwing Frilly Underwear then!'"